If you could hop in a time-traveling spacecraft, go back three billion years and land any place in our solar system, where would you want to end up? Earth, with its barren continents and unbreathable atmosphere? Or Mars, a chillier version its big brother? Wait, what about Venus? Venus has a rep for being a toxic hellscape, but three billion years ago, it may have been the best piece of real estate our solar system had to offer—or at least, a close second to Earth. This hypothesis has been around for years, but it’s gaining traction thanks to climate models developed by researchers at NASA’s Goddard Institute for Space Studies and elsewhere. 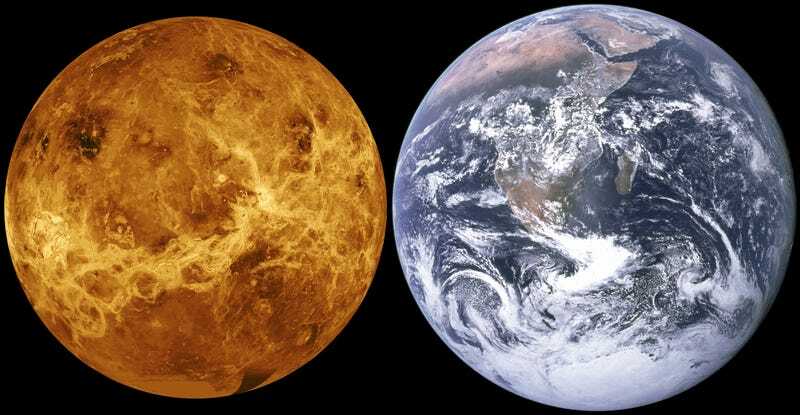 Those models show that for two billion years, Venus could have had balmy, Earth-like temperatures and liquid water oceans, despite getting dosed with 40 percent more solar radiation than Earth is today. But it depends on whether the Venus of bygone days spun as slowly as modern Venus does. The habitability of Earth and Mars have changed throughout the lifetime of the solar system. Geologic evidence suggests that Mars was much wetter in the distant past, although whether the Red Planet had liquid water oceans or was frozen under a mantle of ice is still a matter of debate. Earth, meanwhile, has swung from hothouse to icehouse and back, all the while accumulating oxygen in its atmosphere and becoming a more favorable place for complex life. But what about Venus? The past habitability of Earth’s nearest neighbor has received scant attention compared with that of Mars. Our bias may stem from the fact that modern day Venus is so forbidding, with its impenetrably thick atmosphere, toxic thunderclouds, and atmospheric pressure nearly 100 times higher than that of Earth. When a planet turns spacecraft after spacecraft into a puddle of goo within seconds, it’s only natural for people to get frustrated and turn their attention elsewhere. Still, just because Venus is weird and awful today doesn’t mean it always was. The entire surface was reworked by volcanic activity some 700 million years ago, and we have no idea what Venus looked like before that. But measurements of the hydrogen isotope ratio in Venus’ atmosphere imply that the planet used to have much more water—maybe enough to support oceans. Taking a first stab at the question of whether Venus was once habitable, Way and his colleagues combined a global topographic dataset collected by the Magellan spacecraft with water and solar radiation estimates for past Venus. All of this information was plugged into global climate models, similar to those used to study climate change on Earth today. The initial results were encouraging. Despite the fact that ancient Venus would have received much more sunlight than modern Earth 2.9 billion years ago, Way’s models predict an average surface temperature of just 11 degrees Celsius (52 degrees Fahrenheit). By 715 million years ago, the surface would have only warmed up four degrees—meaning Venus could have had a temperate climate for at least 2 billion years. There is, however, a catch: those numbers are entirely dependent on past Venus having similar topography and orbital characteristics to modern Venus. When Way re-ran his models but gave 2.9 billion year-old Venus a facelift to look like modern day Earth, surface temperatures rose considerably. “We wanted to see what effect topography might have had on the climate state of this world,” Way said. “Sure enough, it had a big effect.” The reason, he says, probably has to do with changes in the amount of reflective surface on Venus, and shifting atmospheric dynamics. Another fascinating twist has to do with Venus’ rotation. In his initial models of 2.9 billion year old Venus, Way stuck with a slow, modern-day rotational period of 243 Earth days. But when he spun Venus up to give it a 16 Earth-day period, the planet once again became a pressure cooker. This has to do with the impact of Venus’ rotational rate on atmospheric circulation patterns called Hadley cells. Specifically, slow-rotating Venus develops a gigantic cloud right at the sub-solar point, that is, where the sun’s rays are hitting the surface dead on. This basically turns the atmosphere of Venus into a giant solar reflector. When Venus rotates more quickly, this pattern doesn’t form. While the study doesn’t actually confirm that Venus was once habitable, it does point to a plausible scenario in which Venus could have been. It’s worth noting that a planet’s rotation rate can change dramatically over time—Earth’s rotation is gradually slowing down because of the Moon—and some researchers suspect that Venus spun more quickly in the past. But there’s no easy way for us to find out. We could get indirect evidence by doing population studies on small, rocky exoplanets in Venus-like orbits. And, if Venus was a balmy paradise for billions of years, one has to wonder what sort of apocalypse led to the present-day situation. “We really need more data before we can say much more,” Way said. But, he added, the study does indicate that worlds in Venus-like orbits should not immediately be deemed uninhabitable. A past-habitable Venus also opens up new possibilities about the origin of life on Earth. From meteorites, we know that Earth and Mars were swapping material in the distant past, prompting astrobiologists to wonder whether the Red Planet could have seeded our world with life. But if life was just as likely to emerge on Venus, that’s one more planet to add to mix. Incredibly, we don’t know whether there are any meteorites from Venus here on Earth, because we’ve never been able to analyze a rock on Venus for comparison. Update 8/6/16: The new study by Way et. al has been accepted for publication in Geophysical Research Letters and is now in press.